I have been following the wines of Henry Marionnet ever since I first encountered his cuvées from nongrafted vines, so I was delighted to be invited to have lunch at the domain when I was in the Loire updating my Guide to Wines and Top Vineyards of the Loire. The vineyard is pretty much at the eastern edge of Touraine, not far from the great Chateau of Chambord (of which more in a moment). “Here we only make special wines that others don’t make. All my life I have looked to make the best wine, and not like the others,” says Henry Marionnet. Henry’s father started the domain before the first world war, but he had 20 ha of hybrids. Henry built it up to its present level, mostly with Gamay and Sauvignon Blanc, but with an interesting in reviving the original wines of the area, in this case meaning cultivating some old varieties, planting vines on their own roots, and making wine without adding sulfur. Today his son Jean-Sébastien is the winemaker, but Henry is still very much in evidence. Ungrafted vines are a specialty of the domain, and there are presently 6 ha, including Gamay, Malbec, Sauvignon Blanc, Chenin Blanc, and Romorantin. Both the cuvées of Romorantin come from ungrafted vines. Romorantin is an old variety of the area that has almost disappeared, possibly because it’s a late variety—it is always the last to be harvested. (It is permitted in Cheverny AOP and is the basis for Cour-Cheverny AOP). Indeed, most examples of Romorantin give me the impression of having struggled to reach ripeness. It is different at Henry Marionnet, where there are two cuvées. Pucelle de Romorantin comes from a plot of ungrafted vines planted in 2007, while Provignage comes from a plot of vines that precede phylloxera. We started with Provignage before lunch, because “it has so much finesse and elegance it deserves to be appreciated alone,” Henry says. 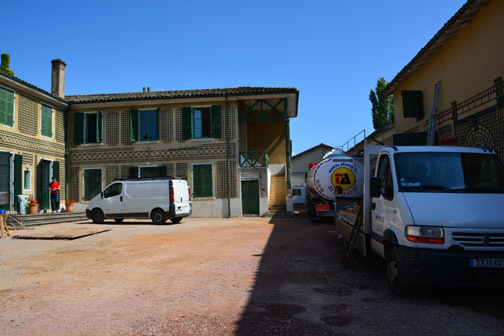 The very old Romorantin was a small part (a third of a hectare) of a 4 ha plot that Henry purchased in 1998. The plot was not regarded as anything special by the previous owner, who included the grapes with other varieties he sold to the cooperative, and it’s lucky it survived; it would probably have been pulled out but these were among the only vines to survive the great freeze of 1956, so they were left alone. 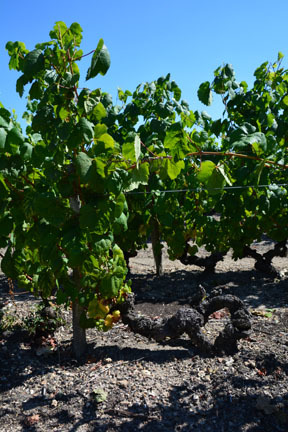 Are these the oldest vines in France? Henry Marionnet dates this plot of Romorantin from the 1850s. “The owner proposed to sell the vines to me 15 years ago. I immediately called INAO and asked them to come and take a look at the vines. They couldn’t tell the age, and asked if they could pull out two vines. They dissected them at Montpellier and reckoned they had been planted in the first half of the nineteenth century.” The plot still contains more than three quarters of the original vines; when a vine dies it’s replaced by using marcottage (sticking a branch into the soil until it roots). Curiously for the era in which the vines were planted, they are in tidy, well separated rows. Henry claims these are the oldest vines in France. Provignage has dense flavors, with an impression somewhat reminiscent of white Burgundy with a touch of Chenin Blanc. It is unique. Other varieties have multiple cuvées. “We’ll compare the normal cuvée­—well, there is nothing normal here—with the ungrafted vines,” Henry says, as we start our tasting. In fact, things rapidly became more complicated as there are three lines: “normal,” Première Vendange, which is made in exactly the same way but has no sulfur used at all in vinification or maturation; and Vinifera, which comes from ungrafted vines. For Gamay, Renaissance is a cuvée that is a two-fer, coming from ungrafted vines and having no sulfur. Jean-Sébastien first made it in 2014. There is also Les Cépages Oubliés, a cuvée from the unusual variety Gamay de Bouze. This is thought to have come from a village near Beaune, around the 18th century. It’s a partial teinturier (the juice has some color) and was banned at one time—“because it made good wine,” Henry says dryly. The Sauvignon is very good but the Vinifera has an extra level of purity. “The damage that phylloxera did lingers on,” Shakespeare might have said. When you taste the Gamay, you think, this is very good, it puts most Beaujolais to shame, then when you taste Première Vendange, you think, this goes a step further, and then Renaissance pushes that back, Each wine successively becomes more subtle and complex. “This is a pure wine, no sulfur, no rootstock,” Henry says when we reach Renaissance. Gamay is the heart of the domain: “here you drink Gamay and you eat Gamay,” Henry comments as we finish lunch with a fruit tart made from Gamay with a sauce made from Gamay de Bouze. The fist vintage at Chateau Chambord (although not under that name) will be 2019. When I mentioned to the sommelier at my hotel that I had visited Henry Marionnet, he said that the wines were good but rather expensive. That they are: but how often do you get to drink wines from 150-year-old vines, or for that matter from ungrafted vines in Europe? They are worth trying, and the comparison between vines on rootstocks and franc de pied (what the French call vines on their own roots) is fascinating. A recent bottle of what may the best wine from the Beaujolais – Jadot’s Clos St. Jacques Moulin à Vent – set me thinking about the contrast between the halo effect of the top wines of Burgundy and the depressing effect of Beaujolais Nouveau. Wines such as Romanée Conti give a lift to the whole Burgundy region, whereas Beaujolais Nouveau makes it difficult for the top wines of the Beaujolais region to break out. I suppose the difference is that no one comments much on generic Bourgogne, so the predominant criticism of Burgundy concerns the top wine, but “Le Beaujolais Nouveau Est Arrivée” became such a catch phrase that it defined the image of the region. All Beaujolais is made from the Gamay grape, but you might never know it by comparing Beaujolais Nouveau with the top wines – produced in nine Crus, of which Moulin à Vent, Fleurie, and Morgon are the best. Most Beaujolais has always been made for early drinking, but Beaujolais Nouveau is the extreme case, bottled when fermentation has barely finished. It was a lifesaver in the 1950s when sales of Beaujolais were depressed, and was marketed so successfully that eventually it rose to about half of all Beaujolais. In decline today, it is now about a third of all production, but still it has a terrible effect on the reputation of the region. It can be a refreshing enough drink when made by a good producer, but it’s closer to fermented grape juice than to wine as such, and it needs to be drunk within weeks rather than months. It has given the region such a poor reputation that the Crus don’t even put “Beaujolais” on their label, eliminating all possibility of a halo effect from the top wines. Perhaps it’s unfair to say that as Beaujolais as such is over-rated since it rarely attracts much positive attention, but there remains an awful lot of Beaujolais, or even wine at the higher level of Beaujolais Villages, that is only marginally better than Beaujolais Nouveau. But let’s say that at its price level even a better Beaujolais has difficulty competing for the new consumer, who likes wine with more obvious fruits and density on the palate. It’s hard to see what Beaujolais can do about this, since the combination of the Gamay grape with terroir and climate just isn’t going give a more flavorful wine. Gamay is not a great grape. Philip the Bold tried to eliminate it in 1395, but the incentive to grow something so prolific kept it alive and well in Burgundy until the mid twentieth century. When phylloxera hit the Côte d’Or at the end of the nineteenth century, almost 90% of black grape plantings were Gamay. It wasn’t until around the second world war that Pinot Noir became clearly established as the majority grape. Since then, Gamay has been relegated to the outskirts. What little remains in Burgundy is used exclusively in the Passetoutgrains blend with Pinot Noir; and I have to say that in pairwise tastings to compare a producer’s Bourgogne Pinot Noir with his Passetoutgrains, I have never preferred the latter. The blend always seems clumsy, with muddy fruit flavors, compared with the elegance of Pinot Noir, even at the generic level. Gamay has had its last fling in masquerading as Burgundy, because recent protests abolished the loophole that allowed some Beaujolais to be described as Bourgogne Rouge. But if any wine could persuade me that Gamay can have pretensions to greatness, it is Moulin à Vent from the old Château des Jacques. I remember this when it was part of the Thorin estate; always a powerful wine, with good structure, and some capacity to age. 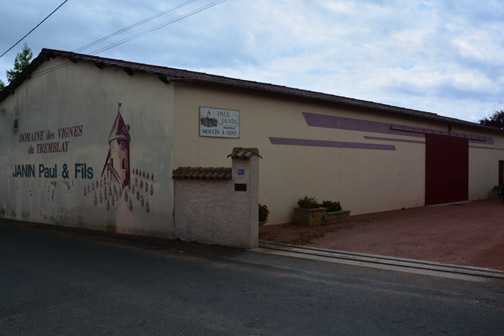 The estate was purchased by Jadot in 1996. 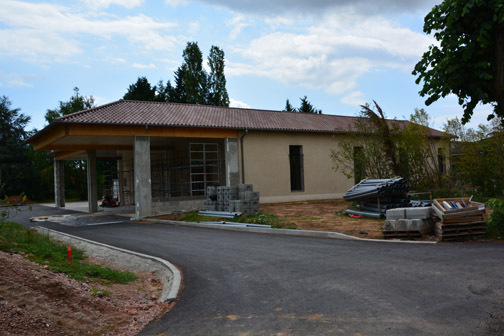 The major part is planted with Gamay, but there is a separate Clos planted with Chardonnay. (The same change in the rules that eliminated Gamay under the Bourgogne label means this must be labeled Beaujolais Blanc and not Bourgogne Blanc.) The wine is made along Burgundian lines, with punch down during fermentation, and maturation in oak varying from new to two year old. I remember enjoying older vintages, up to about ten years of age, when the wine was made by Thorin, so when I saw the 2005 vintage available soon after release, I thought it would be interesting to purchase a few bottles and see how they matured. So far the wine has been doing well, in fact well enough that I wish I had a sufficient supply to keep the experiment going a bit longer. Initially it was quite dumb, with a slightly thick quality to the fruits, but my tasting notes taken at yearly intervals (below) show that it has slowly developed variety and complexity. I don’t think it has reached its peak yet. The most recent bottle, a couple of days ago, much reminded me of Pommard, and I think it will become increasingly more like Burgundy as it ages. With increasing pressure on price, with Burgundy beginning to follow Bordeaux into the realm of disproportionate prices, can the Beaujolais Crus become somewhere to take refuge, especially where there are wines with aging capacity? Of course, the Crus themselves cover a rather wide range of qualities: only Moulin à Vent, Fleurie, Morgon, perhaps Juliénas and Chénas, really have the capacity to show developing flavor variety and complexity with age. Except in rare cases, Gamay is not going to compete well with Pinot Noir, but the top Beaujolais Crus are certainly worth a look. Tasted 2011 This might now easily be mistaken for a Pommard village wine from a good producer. Granted the fruits are a little more black than red and there is a slightly spicy edge to nose and palate, and the impression is a little less refined – but then Pommard can be quite rustic. The wine is aging quite slowly, but the black cherry fruits of the palate are becoming soft and supple, yet are still supported by ripe tannins. The overall impression on the palate is smooth with a lovely balance of fruits to acidity and tannins. The wine should continue to improve for another few years and may well become more Burgundy-like as it ages. Tasted 2010 Very good, sweet ripe fruits on the palate and nose, but still fairly straightforward – one was hoping for some complexity to begin to emerge by now. More ripeness showing than earlier years, but seemingly less complexity at the same stage. Just a faint touch of tannin on the finish suggests there may be enough structure for the quality to come out in the next year or so. Tasted 2009 Still a dark ruby color with purple hue. Black fruits on the nose are a little stern. Quite full on the palate, sweet ripe fruits of black cherries, plums, blackcurrants, but some ripe tannins give support for longevity. A little monotonic in its youthful flavor spectrum, but more complexity will develop. Can drink now but will hold and improve for several years. Tasted 2008 Purple color is quite dark. Dominated by black fruits on the nose, mostly cherries, and quite full on the palate with a smooth impression of dark fruits and good tannic structure. Give it three or four years for the tannins to resolve and it will be an example of the peak of what a Beaujolais Cru can produce. Extraordinary value. Tasted 2003 This wine shows what Moulin à Vent can accomplish. It is dark garnet color with black hues and a narrow pink rim that does not yet show any orange. The medium intensity nose has some astringent notes and hints of Burgundian farmyard overlaying black fruits. It is relatively stern on the palate. Dry, with just above average acidity, medium density black fruits showing, and a distinct bite on the finish due to the acidity and some tannins. The alcohol is high for the appellation at 13% and can be discerned on the nose, but does not obtrude upon the palate. This wine could easily be mistaken for something from farther North, in Burgundy proper.